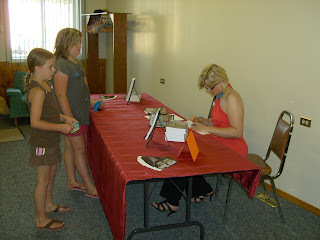 On the evening of Thursday, August 7th, 2008 Alberta author Lori Knutson launched her children’s novel The Ghost of Northumberland Strait. The launch was held in the village of Hughenden in the southeast part of the province, where Lori lives and teaches school. The launch was well-supported by the community and the local media was very cooperative in helping to promote the launch prior to the event. Lori was interviewed in The Provost News by publisher Richard Holmes and also on radio by Key83 broadcaster and literacy advocate Jeff Newland. People attending the launch enjoyed refreshments and entered the draw to win a copy of The Ghost of the Northumberland Strait. 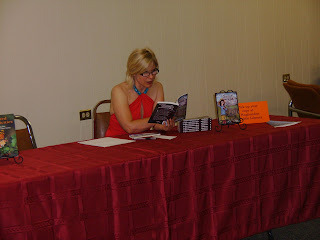 Lori read from the new novel and signed copies of it and her previous work. The launch was co-hosted by the Hughenden Public Library. Staff and board members helped serve snacks, visited with guests and cleaned up afterwards. Other community libraries lent their support by posting information regarding the launch in their library buildings and by distributing bookmarks featuring cover art from The Ghost of Northumberland Strait.